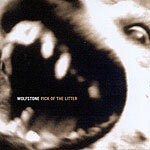 CD review: "Pick of the Litter"
This review first appeared in the October 18, 1997 edition of the American Reporter. Wolfstone is contemporary Celtic, writing songs about current issues and mixing Gaelic tradition with rock 'n' roll, blues and American country. The band's music, captured in a new anthology, is like no other music you've heard. The members are virtuosic musicians, the lyrics hit social issues as hard as any bleeding-heart folkie, and the songs stick in your head for days. The opening anthm, "Battle," starts off as an uptempo reel, and only gets faster with each break, until the breathtaking finale which outros as a Van Halenesque hard rock song with Stuart Eaglesham's electric guitar dueling with Dougie Pincock's bagpipes. The next cut, "Tall Ships," has a country feel about, while "White Gown" hearkens more to Al Stewart's mid-'70s ballads. Just about every song has a strong rock element running right down the middle, giving Wolfstone's music an instantly accessible feel to it.